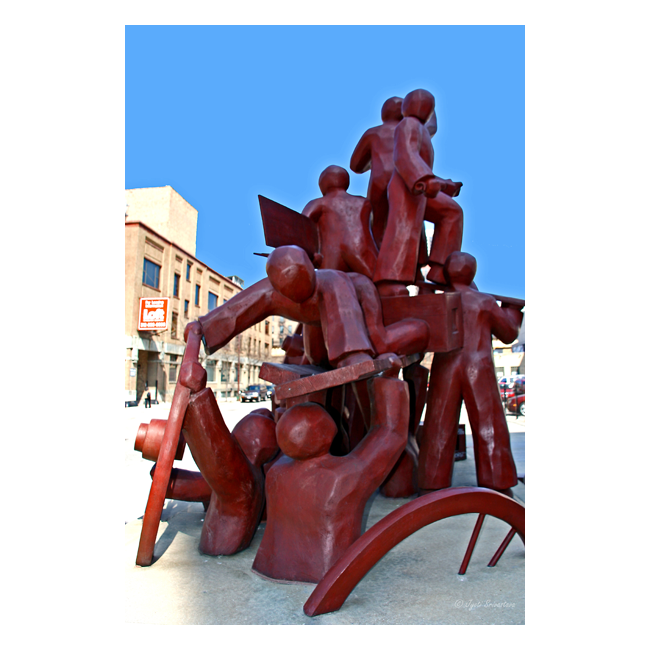 The public art collection of the city of Chicago is overseen by the Visual Art department under Chicago’s Department of Cultural Affairs and Special Events [DCASE]. DCASE is dedicated to enriching Chicago’s artistic vitality and cultural vibrancy. There are many departments working under DCASE like Fashion, Design and Culinary Arts, Performing Arts and Visual Arts. Here we are concerned with Visual Arts department. The Public Art Program can further be divided into.. Although bulk of the public art collection is a result of the Percent for Art program; however, Special Projects have also contributed significantly to the cultural enrichment of Chicago, by creating and placing artwork in very public and, occasionally, unexpected sites. The City’s first large-scale Special Project was “Botero in Chicago”, 1994. However, perhaps the most broadly known Special project has been 1999 “Cows on Parade”. 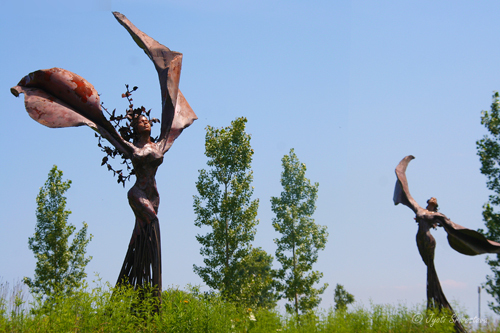 This post is about the Special Projects under Chicago’s Public Art program. Public Art Program of the City of Chicago.. The Department of Cultural Affairs in partnership with Chicago Park District organized a Special Project “Niki in the Garden” at the Garfield Park conservatory. 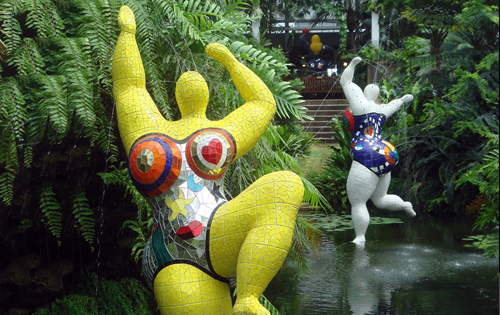 The exhibition consisted 34 works by the late 20th Century French artist Niki de Saint Phalle. Her characteristic bulbous forms – which run from animals to mythological figures to her well-known “Nanas” – covered in mosaics of glass, stone, mirror, shell and ceramics. Exhibition includes lion “Guardian”, alligator “Nikigator”, skull, “La Cabeza”, totem pole “Large Yelling Man”, musician Louis Armstrong, basketball players, and many Saint Phalle’s nanas like the Three Graces “Les Trois Grâces”, and “Star Fountain”. Niki de Saint Phalle was born in 1930 in Neuilly-sur-Seine, France and raised in New York City. She was a self-taught artist. Developing crippling rheumatoid arthritis later in life that made it very hard for her to use her hands and even walk, she never stopped working day in and day out while in the midst of a project. Her art was her life, and she was determined to live it. In the early 1990’s Saint Phalle settled in southern California, and in 2000 she was awarded the acclaimed 12th Premium Imperial Prize in the sculpture category, considered the Nobel Prize equivalent to those in the art world. She remained in California until her death in 2002. In 2006, Allstate Insurance Company sponsored the Artists and Automobiles exhibit in honor of the company’s 75th anniversary. The Public Art Program of the Chicago Department of Cultural Affairs partnered with the Chicago Park District to organize this show which highlighted the work of five Chicago artists: Mary Brogger, Ted Garner, Dessa Kirk, John Mason and Lucy Slivinski. The artists were allowed to select automobile parts at Tech-Cor, [Allstate’s state-of-the-art research and training facility in Wheeling, Ill.], which was delivered to their respective studios. The artists used the discarded car parts like windshields, tailpipes, mufflers, sidewalls, springs and bumpers, and made them into pieces of art, like: Lilies [by Dessa Kirk], Glass Bench [by Ted Garner], Hedgerow [by Lucy Slivinski] and Arise 2 [by John Mason]. 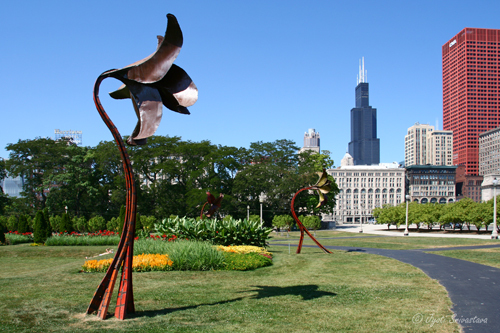 Today, the installations of three of the artists remain in the Grant Park. These are the works of artists Dessa Kirk, John Mason and Lucy Slivinski. Dessa Kirk’s enormous red Lilies are made of doors, hoods, trunks and roofs from several Cadillacs. John Mason’s Arise 2 presents a somewhat more abstract version of a large flower. Lucy Slivinski’s Hedgerow is a garden feature composed of entwined mufflers, tailpipes, and headlights. Daphne Garden by Dessa Kirk / Originally part of 2004 Special Project “Artists in the Garden”. 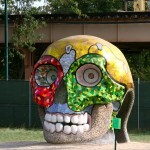 In 2004, there were twenty-four “Art in the Garden” installations in Chicago’s various parks. For the temporary exhibit, artists were asked to integrate plant material into their installations to create constantly changing displays. One of them was Daphne Garden by Dessa Kirk. 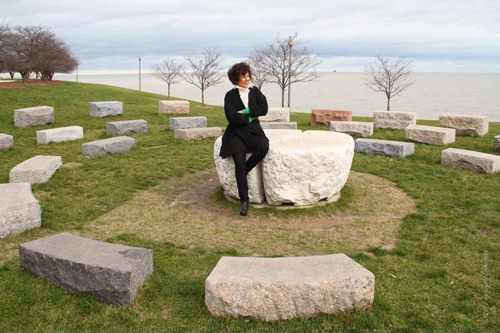 It was so well received that so well-received that the temporary installation was moved to Northerly Island in 2006. On the evening of May 4, 1886, a tragedy of international significance unfolded in Chicago’s Haymarket produce district, when bombs were thrown at protestors. The site of the Haymarket bombing has become a powerful symbol for a diverse cross-section of people, ideals and movements. Its significance touches on the issues of free speech, the right of public assembly, organized labor, the fight for the eight-hour workday, law enforcement, justice, anarchy and the right of every human being to pursue an equitable and prosperous life. 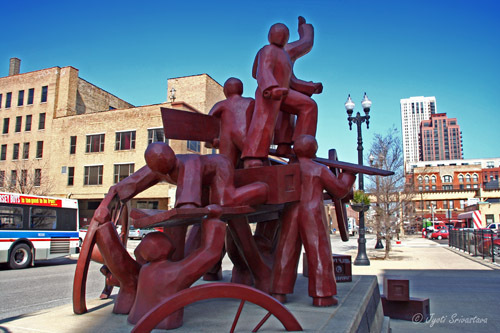 The sculpture by Mary Brogger commemorates the Haymarket Riot, and marks the precise location where the historic events occurred. 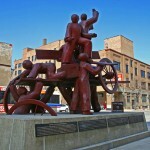 The site of Haymarket Tragedy was designated a Chicago Landmark on March 25, 1992. The year 2002 had two special projects, utilizing the unique feature of the Chicago River cutting through the heart of the city. Herbert Migdoll’s Swimmers was composed of four 60 foot-long depictions of swimmers installed alongside the river. Nancy Van Meer’s monumental paintings were installed on the underside of the State Street Bridge and only visible to the general public when the bridge was raised, but visible at all times to anyone on a boat. Temporary Exhibition: June 15 to October 2001. Suite Home Chicago featured life-sized fiberglass forms of a suite of furniture — sofa, chair, ottoman and television — each decorated by a local artist and sponsored by a business, organization or individual. The furniture forms were produced in Chicago under the direction of Judith Niedermaier, President of Niedermaier, Inc., a local company specializing in the production of home furnishings and visual marketing. In addition to decorating fiberglass forms, artists had the option of creating their own unique furniture pieces. Suite Home Chicago was a public/private partnership administered by the Public Art Program, a division of the Chicago Department of Cultural Affairs. The privately funded exhibition was spearheaded by a committee headed by Daniel Nack, General Manager of Salvatore Ferragamo. Like “Cows on Parade,” the furniture exhibit was sponsored by businesses, organizations and individuals. Sponsorships cost $3,000 for a sofa, $2,500 for a television set and $3,000 for a chair and ottoman [always to be shown together and counted as one piece]. A sponsor can find and pay an artist independently or pick one from the pool of artists who sent in slides of their work to the Department of Cultural Affairs. More than 300 pieces of furniture were on the streets, parkways and plazas. The furniture could be found at sites as far east as Navy Pier, as far west as O’Hare Airport, and stretching from Midway Airport on the south side, to the Chicago Historical Society on the north side. The majority of the artwork is located along Michigan Avenue and in the Loop area. Reference: Chicago Traveller: Suite Home Chicago.. click here.. In 2001, to celebrate its opening, the Chicagoland Motor Speedway [Joliet, Illinois] commissioned Chicago painter Steve Heyman to create a design for the inaugural pace car for the NASCAR Winston Cup Race. Commission awarded by Department of Cultural Affairs. Half hour video produced and aired on Chicago Public Access Cable Network. 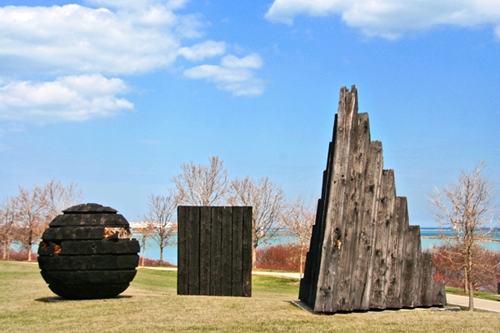 “Three forms for Chicago” comprises of three geometric sculptures – Sphere, Pyramid and Cube – made from recycled wood indigenous the Midwest. These were described as Spheres Turn, Pyramids Rise, Cubes Stay Still. The works were by internationally renowned British sculptor David Nash who works primarily with wood. His sculptural form, often elemental in nature, speak of the collaborative relation with the earth. The charred patina was achieved after the installation by burning the works. Nash’s sculpture were a passionate plea for awareness of the relationship of man with nature and the responsibility that comes from such awareness. 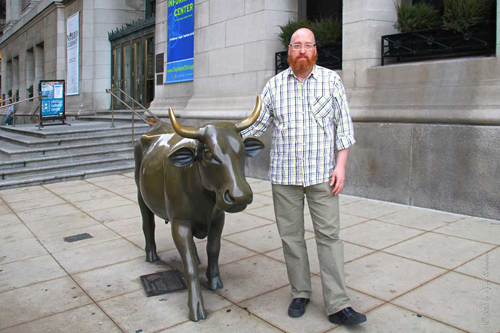 Commemorative bronze cow for “Cows on Parade” / In the image is curator Nathan Mason. Perhaps the most broadly known Special Project has been the “Cows on Parade”. In 1999, a herd of fiberglass cows united citizens, visitors, artists and businesses through a unique community-based public art event, “Cows on Parade”. The public art display was originally conceived and presented in Zurich, Switzerland in 1998. Chicago businessman Peter Hanig saw the cows in Zurich and brought the idea home. He convinced the Commissioner of Cultural Affairs Lois Weisberg, to bring in cows from the Swiss artists who had created the Zurich cows. The City purchased unadorned cows and held a contest for local artists to produce designs to decorate them. A local business could opt to sponsor an artist-designed cow, or to purchase a blank cow for its own design. It featured about 300 life-size fiber-glass cows, hand-painted by local artists, displayed in public spaces throughout the city of Chicago. After the exhibition was over, the Cow Parade cows are auctioned off, and the money was donated to different charities. The immensely popular display attracted about 2 million visitors to Chicago, and charity auction of the cows raised more than $3.4 million.Michael Lash was Director of Public Art for the city of Chicago and Nathan Mason was curator for the exhibition. 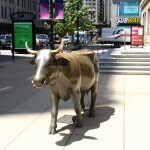 A commemorative bronze cow is located in front of the Chicago Cultural Center. It was a gift of the Hanig family and anonymous donors to the people of Chicago in gratitude for their support of the cows and other public art projects. Depicted as reflections in the eyes of the cow are two famous Chicago landmarks, “The Picasso” sculpture and the ” Historic Water Tower”. I’ve written a separate post, “How 1999 Cow Parade in Chicago inspired a Series of Public Art Projects raising Millions for Charities”.. click here.. Permanent Installation / Now at Adler Planetarium. Composed of stone blocks of varying colors and origins, Americas’ Courtyard is a tribute to the ethnic diversity of America. 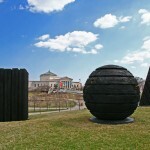 The installation was designed to be modular, allowing the sculpture to be reorganized in relation to its surroundings. 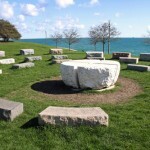 The arena of stones was originally located near the Art Institute of Chicago but was later moved to a permanent location on the lawn of the Adler Planetarium. Here the sculpture was reconfigured to resemble a spiral-shaped galaxy. Artists Ary Perez and Denise Milan worked in conjunction with Adler archeoastronomer Phyllis Pitluga to orient the sculpture to mark the sun’s passage through seasonal equinoxes. The four pathways from the center of the piece correspond to the points on the horizon where the sun reaches its northernmost and southernmost settings on the solstices. 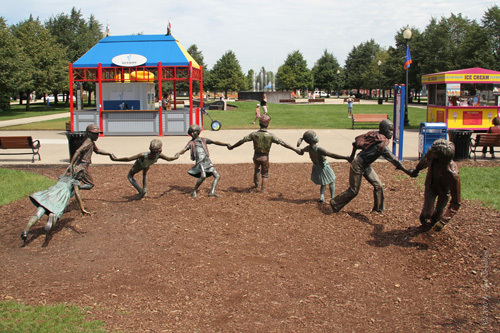 Crack-the-Whip by J Seward Johnson at Navy Pier/ originally part of 1996 exhibit: Horses, Rabbits.. People Everywhere. May 3 through October 30, 1996. Location: Montgomery Ward Gardens, Grant Park, Chicago and Other Places Around the City. The exhibition was organized by Michael Lash, public art curator for the Chicago Department of Cultural Affairs. It featured 16 massive bronze sculptures which included Deborah Butterfield’s larger-than-life horses, Barry Flanagan’s whimsical hares and J.Seward Johnson’s human figures. Grant Park had Butterfield’s horses intermingle with Flanagan’s animated rabbits. Steward human figures were scattered at different public venues as diverse as the two major airports, Navy Pier, the Water Tower and City Hall. 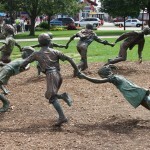 The crack-the-whip sculpture, which is now at Navy Pier, was a part of the exhibit. Reference.. Chicago Tribune report.. click here..
in collaboration with the Marlborough Gallery. Images from the exhibition can be seen.. click here..